Iceland were denied a first win at a major tournament as a late own-goal from Birkir Saevarsson snatched a 1-1 draw for Hungary in Marseille. Gylfi Sigurdsson's first-half penalty had given Lars Lagerback's men a lead that they held until the 87th minute when Saevarsson diverted a cross from substitute Nemanja Nikolic into his own net - continuing an astonishing run of late goals at Euro 2016. Hungary were good value for their point having applied concerted pressure throughout the second half and they head into their fixture with Portugal knowing victory will clinch top spot in Group F.
Iceland were impressive in defence to hold Portugal 1-1 in their opener, but the same scoreline will bring much different emotions, having shown great defensive resolve to hang on grimly to the lead they earned just before the break. Bernd Storck's men, meanwhile, looked less impressive going forward than they did in their surprise opening win over Austria, while off the field, sections of the Hungarian supporters were involved in scuffles with security staff ahead of kick-off at the Stade Velodrome and later lit a flare to celebrate their side's equaliser - incidents likely to draw punishment from UEFA. Pre-match tensions gave way to an edgy start to proceedings, Jon Dadi Bodvarsson headed the first chance over the bar and, despite Hungary looking the more likely, it was Iceland who went close again on 32 minutes, with Gabor Kiraly forced to produce a fine save to thwart Johann Gudmundsson after the Charlton man had shown great strength to fashion a shooting opportunity. Six minutes before the break, however, Kiraly was badly at fault as his side conceded a needless penalty. The 40-year-old spilled a regulation cross into the box, Aron Gunnarsson went down under a challenge from Tamas Kadar as he tried to reach the loose ball and amidst furious protests from the Hungarians, Sigurdsson calmly slotted home from the spot. Laszlo Kleinheisler fired wildly over the bar when well placed as Hungary began the second half brightly and as Iceland dropped deeper and deeper, an equaliser started to look inevitable. The industrious Icelanders were holding firm, though, goalkeeper Hannes Halldorsson reacting smartly to keep out two long-range free-kicks from Balazs Dzsudzsak and Ari Skulason producing several last-ditch challenges to keep his side's lead intact. But Saeversson was helpless with just two minutes to play, turning into his own net after substitute Nikolic had burst to the byline and cut the ball back for Adam Szalai, waiting to pounce if Iceland's right-back had not intervened. 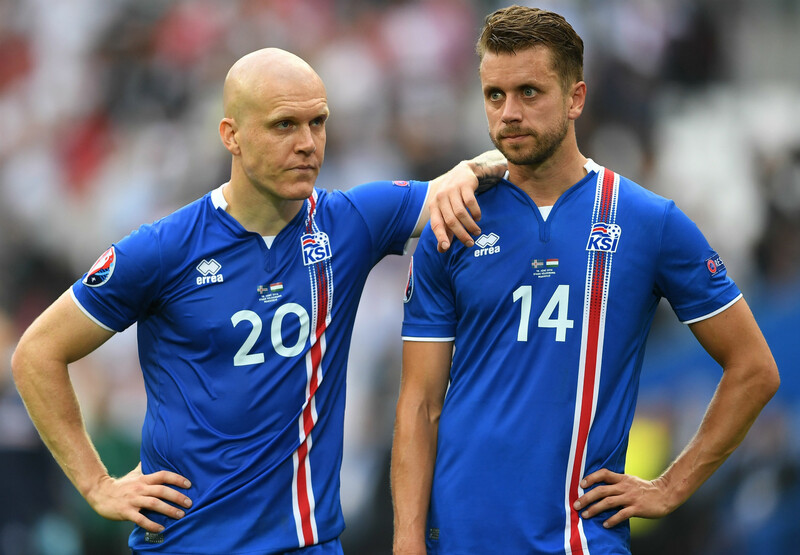 There was still time for Iceland to try and wrestle their destiny back into their own hands as Sigurdsson failed to slip a free-kick under Hungary's wall from 18 yards and Eidur Gudjohnsen's follow-up was deflected wide.